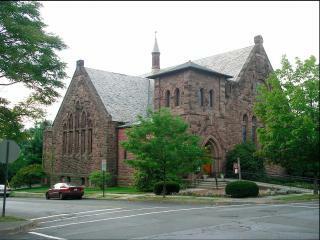 St. Luke's is the oldest Episcopal Church in Montclair. The original St. Luke's Church was built in 1846. After being damaged by fire twice, a new church was opened on St. Lukes Place in 1870. Because the size of the congregation grew, the present St. Luke's Church was built in 1889, designed by R. H. Robertson in the Romanesque style. The Tudor style rectory was constructed on the grounds in 1907 and the present Parish House was opened in 1923. The interior was completely redone in 1929. This building is on the National and State Registers of Historic Places. The church is home to Second Time Around, a second hand shop, and Toni's Kitchen, a soup kitchen. The church participates in numerous other charitable causes.